The perfect accessory for a Canterbury winter. Maggie, 2, models a handknitted snood by Marie Southwood. ​Upcycled denim jackets are on point to wear to a cafe. Woollen check jackets are stylish for romps in the park while double-fleece pyjamas and hand-knitted snoods keep winter chills at bay. We’re talking about urban fashion hounds here; the elegant, long-legged Twiggy of the dog world. Blink-and-miss it running at full gallop across the park, the greyhound has other lesser-known characteristics. Having low body fat and a single layer of fur means the breed can suffer during the cooler months. 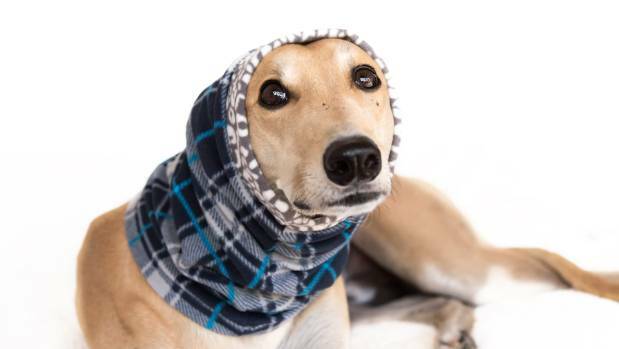 As greyhounds have become more popular as pets, a whole industry dedicated to keeping the breed warm and on-trend has emerged. And greyhound fashion designers are pushing the envelope, making jackets from repurposed blankets and candlewick bedspreads. 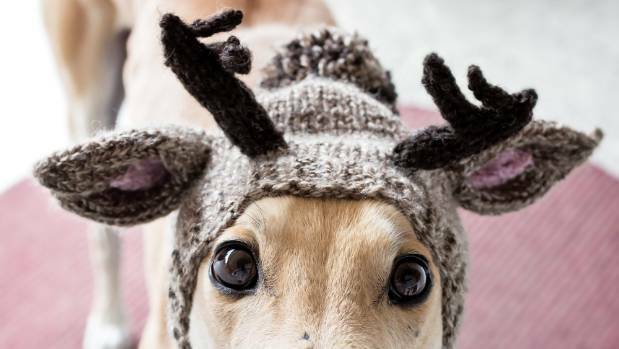 A knitted reindeer hat from Alibar Dog Hats keeps greyhound Jorge’s ears warm. The European dog charity supports rescue dogs in Spain. Greyhounds as Pets (GAP) is a charity that finds homes for retired racing greyhounds. “They are certainly spoilt dogs once they retire. It’s very cool to see,” Cagney said. 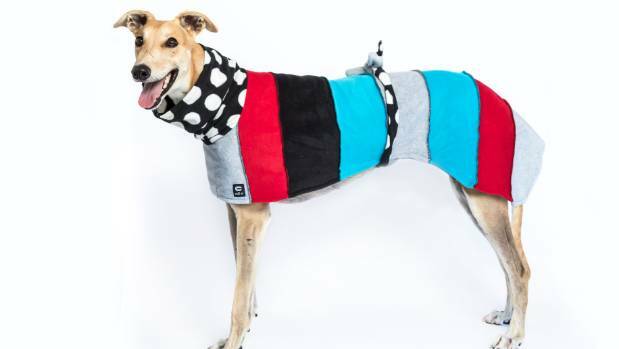 In the Waikato, Catherine Corbett struggled to find coats to fit Diggity Dave, a greyhound she adopted three years ago. A fashion designer by trade, she set about making Dave a bespoke wardrobe and her designs turned heads. Jorge, 7, looks as slinky as a snake in this onesie by Catherine Corbett. 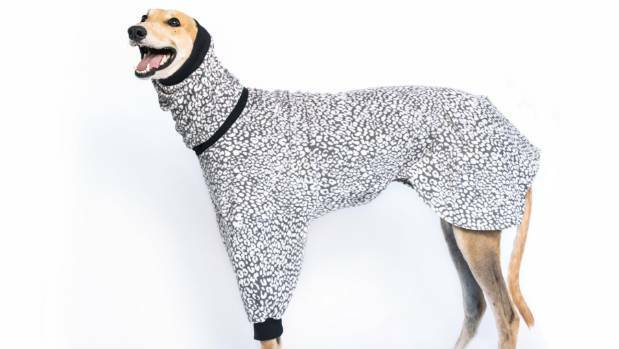 “From there, I got on board with Greyhounds as Pets NZ and began making coats, collars and raincoats for them to sell,” Corbett said. As her greyhound collection has grown (she now has Bella Boo and Hearty Party), so has the variety of clothes she makes. Corbett has branched out with her own business, Caff 10, and a website for fashion hounds. She makes coats from old woollen blankets and candlewick bedspreads, which she buys from op shops or is given by friends. A tartan polar fleece snood by Catherine Corbett is a statement piece and neck warmer. Corbett also makes onesies and knitted sweaters; after all, greyhounds are famous for lounging in between bursts of explosive energy. “They like to sleep in their sweaters,” Corbett said. Old jeans with tatty hems and fading are cut up and turned into coats, giving dogs newfound street cred. Outfits are accessorised with handmade snoods, collars and bandanas. Jorge’s coat of many colours by Catherine Corbett is fun and racey. “I try to use as many upcycled and natural materials as I can, both for the environment and because natural fading and wear adds to the coats’ aesthetic,” Corbett said. 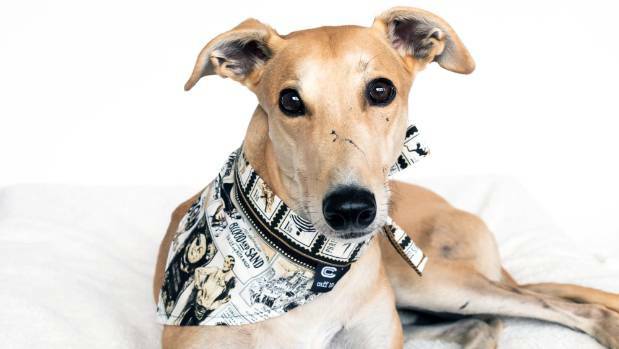 Kathleen Crisley from The Balanced Dog is taking greyhound couture a step further by organising a fashion show in Christchurch in July. 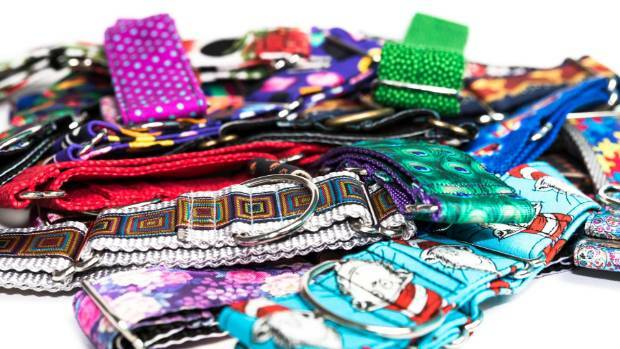 It aims to show off the latest dogwear labels, while raising money for GAP. “Fashion is a strong inspiration. It’s not costume, it’s fashion. I wasn’t prepared to do Halloween costumes and that sort of thing. I don’t dress my dog, Izzy, to make light of her. I dress her in functional clothes, but she can still be fashionable,” Crisley, a dog massage therapist, said. Say it with a bandana. Jorge gains street cred with this number by Catherine Corbett. The show at the Christchurch Casino at 3pm on Sunday, July 8, begins with an “al naturale” section in which dogs will wear collars only and show off their own fur coats, from fawn to brindle and black-and-white. Then there are sections for knitwear and snoods, light and deep winter, and summer, which includes life jackets. “Most greyhounds don’t swim very well if they fall in a pool or anything because fat is what makes you buoyant,” Crisley said. 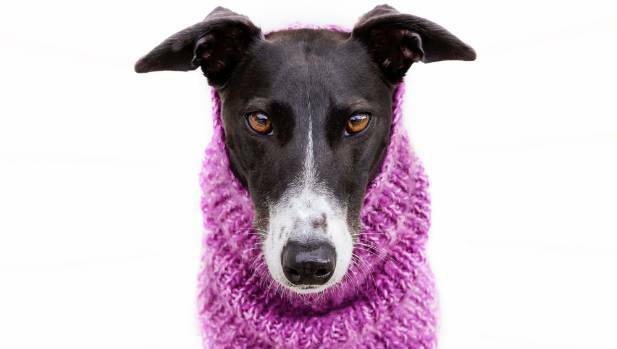 Maggie’s handknitted snood, by Marie Southwood, will take her from lounging on the couch at home to a stylish romp in the park. As a home checker for GAP, she said owners who leave dogs home alone in unheated houses during the day might want to consider dressing their dogs for the indoors. Marie Southwood, GAP’s adoptions co-ordinator for the South Island, buys cheap handknits from op shops and uses the wool to knit snoods and jackets. Jorge is all class in a collar by Rad Hounds of New York City. Her black greyhound Ben, adopted three years ago, will be striding the catwalk at the fashion show. He’ll be variously wearing a blue, cabled knitted wool jacket with a snood, a repurposed blanket coat and double-fleece pyjamas, all made by Southwood. “He’s got Swandris and he’s got oilskins. I make collars for him, too. I had to buy a chest of drawers on Trade Me the other day to put Ben’s clothes in it,” Southwood said. 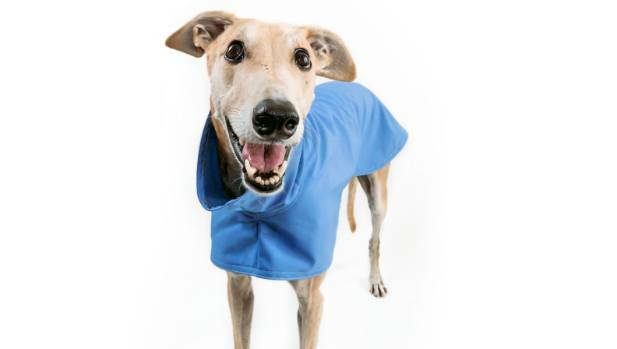 Jorge in a versatile blue jacket from the GAP (that’s Greyhounds as Pets) shop, Greyt Stuff. 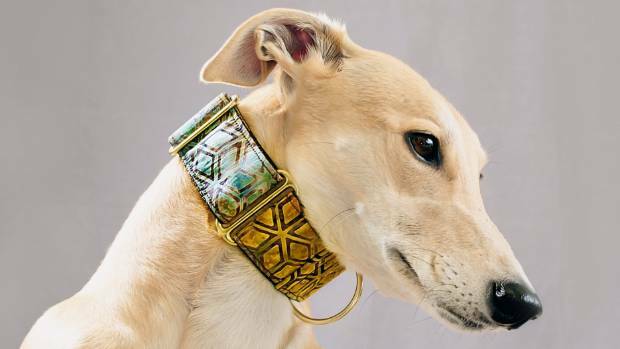 When it comes to fashion, greyhound owners can be a competitive lot. When dogs appear on social media wearing their latest outfits, owners are keen to know where the garments were bought. “Most greyhound owners suffer FOMO or the fear of missing out. Many of the owners knit and make clothes for their dogs and it can be a little competitive,” Southwood said. 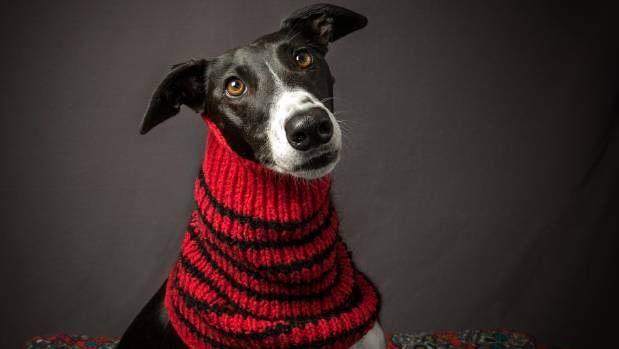 Colourful collars are a must-have accessory for the modern greyhound.